Today I am busy, busy, busy cleaning mildew off the porch ceiling and washing down the warm weather furniture. Once it’s done the yard and gardens will call to me with more chores. I’m so glad I took time to walk and listen to the birdsong before I began all the spraying, scrubbing and rearranging. 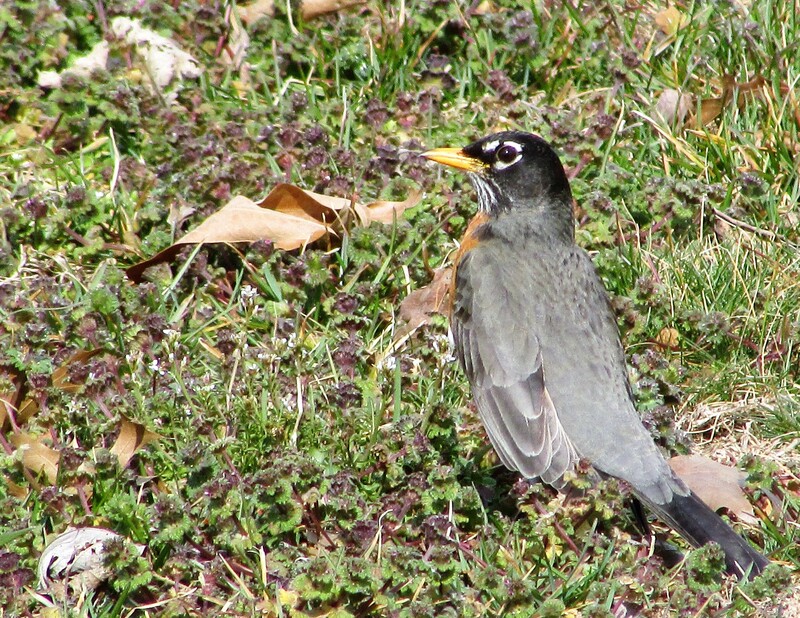 If I hadn’t I would have missed seeing this beautiful robin searching for worms. Yesterday evening I intentionally took about five minutes to simply sit in one of the back patio chairs and listened to the sound of the rain on the tin roof. I didn’t accomplish a single thing, other than perhaps untangling some of the knots in my brain. Then I went back to sweeping floors and doing dishes. But those five minutes spent listening to the rain were absolutely necessary. It’s so true…so often just a few minutes can bring on some needed serenity. That’s what spring does to you. The robin heralds the onset of spring in the Northern Hemisphere, am I correct ? The robins in the UK are red breasted, aren’t they – from your picture I would never have known this was a robin, except you told us. Hi Susie, yes, our robins are connected to the arrival of Spring, but sometimes you might find a stray robin or two in the winter. Just like the geese in our area, not all birds that used to fly south still do…most of the geese in our area overwinter here. Right now the robins are everywhere. They are very different from the European robin. I think ours are a larger bird. It’s so much fun to see them pulling worms out of the ground. Right now they are beginning to nest. Their song is so cheerful, this morning as I was having my devotions, I could hear them singing outside, even through the closed window.